Founded in 2007, the magnificent Warsaw-based Meccore String Quartet has won some prestigious chamber music awards. This young Polish group made their MDG debut with a disc of the string quartets of Grieg, which was well-received by three different MusicWeb reviewers. They had earlier released an album of Szymanowski and Debussy quartets on Warner in 2016. 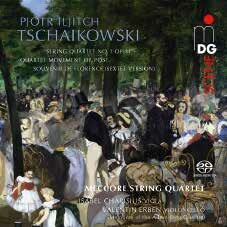 Now MDG offer an SACD of works by Tchaikovsky in an attractive program, with the popular first quartet, and the string sextet ‘Souvenir de Florence’. These were among the first and last of the composer’s major works, as the quartet was a breakthrough work for him, while the sextet was his last multi-movement work except for the 6th Symphony. On the quartet’s website (though not on the disc), this issue is described as ‘Tchaikovsky’s Complete String Quartets, Vol. 1’. The first quartet opens with a lovely, ingratiating first subject. It is hardly a ‘tune’ but still memorable, with its 9/8 metre and Moderato e semplice and dolce markings, piano but with a full texture, and syncopations that obscure the pulse. On the page it looks so ‘composed’ but sounds entirely spontaneous, certainly in the confident and idiomatic handling here. The famous Andante cantabile flows simply and touchingly. Tolstoy is said at have wept at the folksong material, but one does not have to be a Russian artist of super-sensitivity to be affected thus by the Meccore’s account. The scherzo’s alternation of triple and duple time gives it a charm fully matched again by the playing, while the finale is a dancing tour de force with a fierce and frantic coda – the one passage where the young composer asks rather a lot of just four stringed instruments. But then this was the first real Russian string quartet – what a start! For the sextet the extra players joining the Meccore quartet are Isabel Charisius and Valentin Erben of the Alban Berg Quartet (the Meccore players studied with the leader of the quartet, who called them “the best Polish string quartet ever”). With such personnel, it is perhaps not surprising that the weight of the string sound is majestic, while still sounding like chamber music. Thus the full string orchestra version of the piece seems more than usually redundant, though orchestral string sections can hardly be blamed for appropriating it, even though they already have the composer’s glorious Serenade for Strings to themselves. But Tchaikovsky wrote about wanting to write a real sextet, for “six independent voices, so that it becomes a sextet and nothing else”. The Meccore and colleagues launch the sextet with a real swing and maintain a compelling rhythmic élan throughout – Allegro con spirito indeed. The Adagio cantabile sings delightfully – these players make some lovely individual sounds as well as blended ones. After the scurrying middle section of this slow movement the returning melody is wreathed in an enchanting lyrical effusion of great warmth. The last movements sound more Russian in character than Italian, and they too are well-judged in tempo, delivered with real spirit. The finale’s Bacchanalian drive is irresistible. It somehow reminds me of what Elgar wrote about his Introduction and Allegro for Strings – “it is really stringy”! By far the longest single movement on the CD is a student piece, a string quartet movement in B flat major, dating from 1865 when Tchaikovsky was in his final year of study in St. Petersburg. It is more interesting than that makes it sound, with its Russian folksong material and its satisfying form - a sonata movement framed by two adagio sections. We quite often read about Tchaikovsky’s lack of confidence in what he is writing or has written, yet here he is closing his novitiate with what sounds like expertise beyond his years. Certainly, the Meccore play it as if they believe in it, and if it is not in the same league as the completed works, it is a bit more than a makeweight. This is a superb SACD production, the recorded acoustic a prefect compromise between the closeness that reflects the intimacy of chamber music and the space that the sextet in particular needs to bloom in climaxes. There is a good booklet note, but this is above all a superb programme splendidly performed. For these three works I have usually turned to an old Teldec (1993) issue, two CDs with the Borodin Quartet in all three quartets, plus the B flat quartet movement and the sextet. That is still a fine Tchaikovsky string chamber music compilation, but I shall now turn to this issue for the two main works. I don’t know better versions of any of these works. For those familiar with the composer’s orchestral music and wanting to explore further, this would be an ideal next step. And those who love the music already, and who appreciate fine sound, should want to hear this too. On to Volume 2, please!